Today, I want to explain the difference between Chinese rubber (DHS Hurricane 3 for example) and the ESN Tensor Rubber or High Tension Rubber (for example Tenergy 05). I also explain the advantage of Chinese rubber and why pro players prefer playing Chinese rubber on their Forehand. 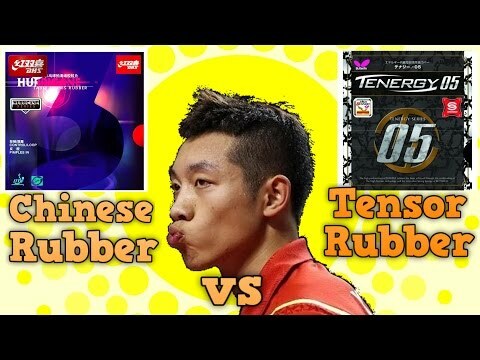 Difference between Chinese table tennis rubber and European rubber? First of all, do we really need a Chinese rubber? Chinese rubber and tensor rubber don’t have the same throw angle. Why chinese rubbers are tacky? Why pro players tune their Chinese rubber with the booster? Should I use Chinese rubber ? Should I use Chinese rubber as a Backhand rubber ? Should I buy the National Chinese rubber? European rubbers (ENS) are mainly used as the backhand rubber. Here is the list of top 10 backhand rubbers that you should buy. I have many questions about the Tacky Chinese Rubber. You have many hesitations of using Chinese rubber or not using Chinese rubber. I think this is a common question, but no one has explained clearly before, so today I will explain it for you. Many Western players have spent almost 500 dollars even thousand dollar every year to buy the Chinese rubbers. They want to improve their table tennis by equipping the professional setup. Unfortunately, there are many versions of Chinese rubbers: Commercial, Provincial, National. And many are fake. There are also Chinese dealers on Taobao and on the forum, who claimed that they have a relationship with pro players and can get new “National rubber”. They convinced the buyers “We don’t have many rubbers, you must wait for 2 months”. But in fact, the “national rubber” are all fake, the dealer just tuned the commercial rubbers with the booster. The effect of the booster will make the rubber easier to play, to spin. And the buyer thinks that the fake rubbers are legit. But no! Pro players don’t play with a soft version of chinese rubber. The dealer also prints the name of the player on the rubber such as “Ma Long”, “Wang Hao”. But we (player from China) know that these rubbers are all fake. But it’s a good business so we don’t want to tell the truth. Western players continue to buy “fake tuned Chinese rubber” and think that it is “personal national rubber”. Some national DHS rubber are fake! Be careful! So please don’t spend 100usd to buy a fake Chinese rubber. And Chinese rubber is not only DHS (Double Happiness) product. There are many another brands: 729 Friendship, LKT, Yin-He, Globe, Giant Dragon. In China, a young kid just goes to the shop and buys a 5 usd rubber to play for 2 years and improve so fast. In Europe, you spent 500 usd every year to change and test new rubber and didn’t improve at all. I will explain how to choose a good Chinese rubber in the next video. Today I want to compare Chinese and Tensor rubber. This is the spin-force curve for chinese rubber (blue line) and tensor rubber (orange line). In general, tensor rubber can spin the ball easier with the small force. That’s why amateur players prefer tensor rubber as it is easier to spin the ball. However, pro players hit the ball harder. With the tensor rubber, there is a limit that you can’t improve the spin even if you hit harder. Chinese rubber is more linear: small spin at small force but chinese rubber doesn’t have the force limit. If you hit harder, the spin will increase. That’s why pro players prefer chinese rubber on Forehand as we can hit very hard with Forehand. With the backhand, the force is not high enough so it’s safer to use tensor rubber on the backhand. The tensor rubber has in general higher throw angle as it can spin the ball easier. Tensor rubbers are also sensitive to the spin. However, you can’t hit very hard with tensor rubber, as if you hit very hard, the ball will mostly goes out of the table. The throw angle of tensor rubber (orange line) is not consistent in high force domain. But chinese rubber is harder, and less sensitive to the spin. The throw angle is very low and you can hit very hard. This is the main reason why Chinese players using Chinese rubber to loop kill the ball as they can hit very hard. Look at the video of Liu Guoliang and Xu Xin. They can loop kill the ball and the throw angle is very low. Without chinese rubber, they can’t do that. So if you buy a chinese rubber with high throw angle, it’s probably fake. This is the speed-force relationship. The tensor rubber is softer and is more bouncy, springy than chinese rubber. In the small force domain, the speed is higher. But tensor rubber goes to the limit at higher force domain. The pro players can hit very hard and make the ball faster with Chinese rubber. That’s why amateur players find that Chinese rubber is slow, but for Pro players, Chinese rubber is faster. Because pro and amateur are in 2 different force zone. Look at the graph, amateur prefer tensor and pro player prefer chinese rubber. If Chinese rubber doesn’t have tackiness, in the small force domain, the spin and speed is very low. As the chinese rubber is hard, without tackiness, it’s very difficult to spin the ball with the small force actions such as serve, flip, drop shot. So Chinese rubber needs tackiness to increase the spin and speed in the low force domain. The booster is the organic solvent which will be absorbed in the sponge of the rubber. The rubber will be expanded; it will become a little softer and more bouncy, springy. It will make the ball faster and spinier about +10% to 15%. Look at the graph, the red line is boosted chinese rubber, the spin and speed increases at low and mid-range of force. Pro players also boost rubber to increase the feeling of the ball as they want to feel the ball in the serve and serve return. If the rubber is too hard, it’s difficult to feel the ball. Yes. If you have a good foundation: technique, power, footwork. You have a good coach to optimize the technique. Or you can hit very hard. And you like loop kill the ball. No. If you can’t hit very hard. You don’t have a good footwork. Stay with Tensor rubber, as Tensor rubbers give more spin and speed at low force. Many amateur players use Chinese rubber as a backhand rubber to block and push the ball. The chinese rubber is hard, and less sensitive to the spin. They profit this property to use Chinese rubber as a “dead rubber” to safely push the ball. However, for the long term, it’s not good for your Backhand. If you want to use your backhand as a weapon to attack, you should use a Tensor rubber. Chinese rubbers are designed for Forehand attack, but not for the passive Backhand. The dealer profits the fact that everyone wants to improve their table tennis and make many rubber version with a high price. It’s a waste of money. Ask yourself, even Zhang Jike gives you his setup (his true blade and rubber), can you play table tennis like him? No, it’s even worse as the rubber is too hard for you, you don’t have the feel of the ball, you can’t adapt to his heavy blade and you play worse. So why spend thousands of dollars to buy national chinese rubber? Professional setup is harder to use. If you want to use it correctly, you must train for that. You must hit harder, faster. Improve your technique before buying pro setup. If you have any question, you can comment in the Youtube channel. Or you can send me your message on my facebook page. You can also send me your video, if I have time, I will correct your technique by viewing the video. Gentilissimo coach EmRat grazie dei tuoi consigli ! In your experience, who sells legitimate provincial and national versions of Hurricane 3? Tabletennis11.com? I know their stuff is legitimate but their Chinese rubber selection is also smaller than ttnpp and prott, which makes me suspicious. Are there other sites? I can’t think of a mechanism by which tackiness can increase speed as stated in section “Why chinese rubbers are tacky?” . I think tackiness should reduce( NOT increase) the speed. Tackiness increases the “spin” for the serve, or the soft touch shot. Chinese rubber is already very fast (due to hard sponge and elastic topsheet). ttnpp, and prott, buy from one or two sources (on taobao), they are just the retailer, not the provider. Hi, if u use butterfly Innerforce layer alc with Tenergy 80 for forehand, tenergy 05fx for backhand is it ok? Tackiness doesnot increase speed but allows the player to increase the lateral/side/back spin on the ball during the serve.I have seen it multiple times when i serve with hard chinese rubber to a player with tensor the ball seems slower but with lot of lateral/back spin as soon as they try to push it like a regular short push the ball goes up and out of the table.One way to counter this is to put the blade under the ball and push with the center or below center part of the rubber like harimoto see how he deals with chinese rubber i guess his dad taught him that.Speedness of chinese rubber is based on effort and this is where u can wreck havoc with pips players by giving them various speed top spins,just be careful that they fall at the back of the table.Also tacky rubbers slow topspin by battle 2 or 729 08 is way spinnier than t05.Another advantage of tackiness it counters opponents spins. Once you have learnt the proper stroke to use H3 effectively and efficiently there is no real reason to use euro/jap on FH. The amount of spin and power is deadly if you know how to produce it…. You will not find that kind of deadly spin ever from a euro/jap rubber. Blade also plays a big part in the over all feel…. You shouldn’t use fast carbon blades with H3 Neo unless you are playing at a high level. With the new plastic balls all the new esn rubbers claim better spin but it’s not like the celluloid… I used Donic bluefire M3 for my BH pre. Plastic balls… When I started with plastic balls it just didn’t want to bite the rubber (especially the nittaku plastic balls) even tried the newer andro r47 rasanter… So I changed to Yinhe Big Dipper 38deg for BH and the tacky topsheet really bites the new plastic ball consistantly and the new semi tensor sponge gives this rubber a nice balance. Not hard and dead like typical Chinese, not full tensor like jap/euro. The consistant feel and tackiness of this rubber makes it very easy to lift underspin and do deadly banana flicks and consistant BH loops with the new plastic balls. They only key to having the rubber perform consistantly is to make sure you use a plastic sheet for storage after cleaning. My blade is YMLSC and fh was 729 08 and bh 729 Battle 1, top layer of blade hardened by application of 3 layers of polyurethane,i improved a lot but i found the pace on fh drives was not much despite my max strength and all bh shots with force going out of table edge.As i had improved my wrist strength by exercises i was putting significant force on each shot.I felt it was due to the blade and i had another set up 729 Bomb with 729 08 on FH and 729 faster feighun max on bh, blade top surface hardened by 2 layers of polyurethane.With this set up blade still flexible the FH shots pace increased by 50% and BH strength by 25% I had a look at the blade composition and now i understand it. 729 08 on YEO P7 blade i couldn’t produce enough pace on FH. 729 Bomb composition is very unique soft cork followed by balsa and birch with increasing hardness to the outside and the blade works miracles with chinese hard rubber. YMLSC is way softer outside and inside and poor performance with hard rubbers on fh and bh but great performance with tensors. I am planning to play with bomb for few more weeks then transitioning to xiom zeta quad and see how it goes.Xiom zeta quad and bomb have almost similar hardness and stiffness as per revspin. What do u think of this set up.